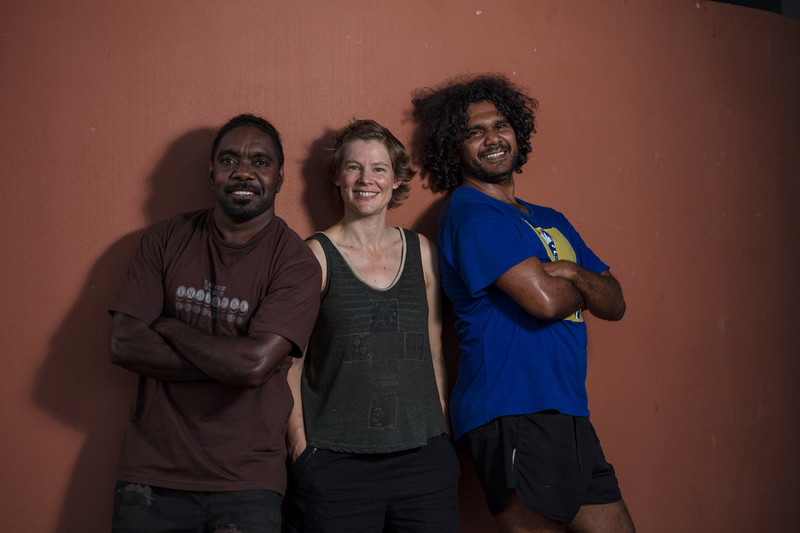 Marrugekus’s new triple bill for the company’s associate artists Edwin Lee Mulligan, Eric Avery and Miranda Wheen kicked off this year with a triple development period in Broome with follow up individual developments at Carriageworks Sydney. Burrbgaja Yalirra (Dancing Forwards is triple bill of solo works curated by Marrugeku’s artistic directors Dalisa Pigram and Rachael Swain as part of a program to support leading change makers in intercultural contemporary dance. Each production explores different facets of reciprocity which challenge our sense of belonging in Australia. Ngarlimbah (You are as much a part of me as I am of you) is a spoken word and animated video work conceived by Walmajarri/Nyikina painter and poet, Edwin Lee Mulligan, in collaboration with award-winning media artist Sohan Ariel Hayes (Cannibal Story, Boorna Waanginy). Ngarlimbah is the essence of reciprocity between human, spirit and environmental realms. Ngarlimbah is directed by Dalisa Pigram and Rachael Swain. Dancer and violinist Eric Avery collaborates with Koen Augustijnen (Belgium—co-choreographer of the award winning Gudirr Gudirr) to create Dancing with Strangers. Eric belongs to the Yuin, Ngiyampaa Wangaaypuwan and Gumbangirri peoples and is a custodian of songs and dances from his father’s line. Dancing with Strangers explores the first colonial contact period, including early and missed opportunities for exchange in language, dance and sharing knowledge. Miranda Wheen will perform a solo dance work choreographed with Serge Aimé Coulibaly (Burkina Faso/Belgium). Miri takes as a starting point the final, initially unpublished, chapter of Picnic at Hanging Rock and the fate of her fictional namesake ‘Miranda’ who seemingly disappeared in the Australian landscape. Reflecting on Miranda, Miri explores the desires and yearning for belonging settler Australians have projected onto the Australian landscapes and it’s First Peoples. Burrbgaja Yalira—Three Short Works will premiere at the Broome Civic Centre playing 31st May to 2nd June 2018 followed by a two weeks season at PICA from 7th–16th of June. Check our web site for news of the 2019 season at Carriageworks and elsewhere in Australia.